This is the fifth in a series of articles that attempts to disclose some of the known issues playing behind the scenes in the Calico Complex and beyond…. Yesterday, the Honorable Judge Friedman issued his verdict for the Calico Complex wild horses and all those now warehoused in BLMs many long-term holding facilities by dismissing all counts of the complaints filed by plaintiffs In Defense of Animals, Craig Downer, and Terri Farley, through the pro-bono legal services of William Spriggs of Buchanan, Ingersoll & Rooney. First, Judge Friedman issued the opinion that though he refused to stop the round up back in December, because he didn’t, any prayer for relief was now moot because the round up had already taken place. He also chastised the plaintiffs for not appealing his initial refusal to stop the round up when he failed to grant the injunction back in December. In my opinion, when Friedman issued yesterday's legal opinion about his ruling to not grant a halt to the round up, he presented a legal argument that shared some twisted semblance of logic used by other kinds of rapists; that “No” didn’t really mean no and the plaintiffs should have asked again. Judge Friedman also cited several other legal technicalities the plaintiffs failed to overcome such as standing – better known as the right to sue due to a legally cognizable interest, actual injury and harm, and failure to establish more than a causal connection between, well, everything that has gone on. Click Here to learn more. While it is generally accepted that the almost 100 now dead horses, 40 or more aborted and/or miscarried foals and dozens of injuries sustained by the Calico herds who DID suffer irreparable harm and injury had no legal voice in the matter, turns out, neither does any of the American citizens whom are shoved aside with the only rights still guaranteed is merely to act as witnesses to the decimation of our American herds - well, that and of course, to fund it. The ruling also reminded us that Judge Friedman found the Safari Club and Nevada Department of Wildlife (NDOW) to have sufficient standing to sign on as defendants in the Calico case due to their “vested interests”. As we saw in the last post, BLM and NDOWs cozy relationship spurred the Surprise Field Office to approve a land use plan that “no longer manages for a reasonable number of wildlife” – that concept is only reserved for wild horses and burros. NDOW is one of the most active and aggressive supporters of “protecting habitat” for the ever-burgeoning big game populations and their influence can be found behind the scenes of every major and most minor management decision being pushed through on public lands in Nevada; NDOW also often targets the easy pickens of wild horse and burro resources to further their goals. After all, who is there to defend the wild horses and burros? Only BLM…. However, NDOWs involvement in wild horses and burro management isn’t limited to just BLM as we will soon see. 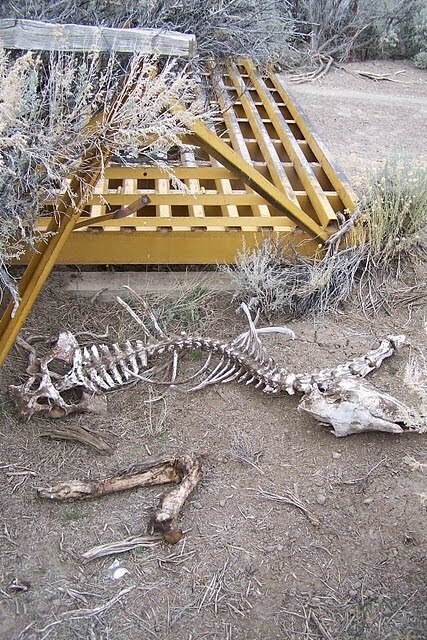 Though Nevada Bighorns Unlimited claimed financial sponsorship of the Sheldon National Wildlife Refuge fence repair and census of wild horses, according to Sheldon manager Paul Steblien, it was NDOWs planes that “discovered” 700 wild horses were missing from the Refuge back in June 2007. It would appear that NDOW also maintains an equally cozy relationship with U.S. Fish and Wildlife Service (USFWS), as not only were they consulting with lawyers and Judge Friedman about their unconditional support for the removal of the Calico wild horses, they have also been very busy behind the scenes working with USFWS managers at Sheldon, BLM, the U.S. Energy Regulatory Committee and yes, the Ruby Pipeline…. 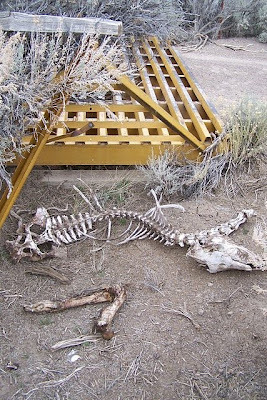 Dead Calico Wild Horse due to round up entrapment by non-compliant cattle guard. 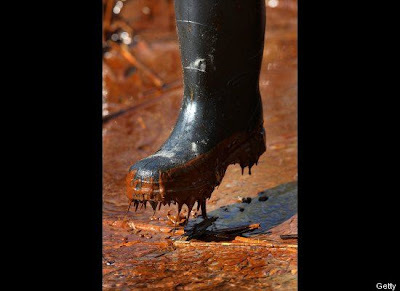 While the DOI’s Minerals Management Services has been bilking the American people out of billions in royalties owed to the nation by the oil and gas industry for decades with a slew of scandals recently heightened by DOI employees in bed – literally – with industry executives, no amount of investigative reporting, scathing exposes, Congressional involvement or promises of reform from current Secretary of the Interior seems to be making a dent in the lucrative sales of our resources through backroom deals. Click Here to learn more. While questions continue about what legally constitutes a bribe with respect to making deals with government employees and public resources, what The Ruby Pipeline’s parent company El Paso Gas is now doing to pave the way for their $3 billion dollar pipeline is not only considered totally legal – it is required. Though the general public gets to review two documents released by the U.S. Energy Regulatory Committee on what erecting the Ruby Pipeline will entail, behind the scenes agencies of all sorts have been involved with intimate “consultation” processes about what they want, what they need and how to negotiate the best deal they can out of El Paso’s war chest before they seal the deal. As BLM was releasing the first environmental assessment to remove the wild horses in Calico in late October, at the exact same time another document was being submitted to Ruby in what can only be described as a gold plated Draft Wish List, which included hefty requests by none other than NDOW itself. This document is titled, “Draft Ruby Pipeline Migratory Bird Conservation Plan” and was recently obtained via extensive FOIA requests submitted by Western Watersheds Project (WWP) on the Ruby Pipeline. According to the FOIA records obtained by WWP, this Migratory Bird Conservation Plan was submitted to Ruby on October 26, 2009. So what does the Wish List cover? Just about everything any and all agencies involved could wish for with a starting price tag of almost $17.1 million dollars when the sum of all the disclosed projects are added together. > $2,000 per acre for fencing in the Little Humboldt Allotment, Castle Ridge, Spanish Ranch Allotment, North Fork Group Allotment, Eagle Rock Allotment, Taylor Canyon, Tuscarora, Diry Peaks, Delano Mountains, Bluff Creek, Mill Creek and 25 additional unnamed allotments in order to protect aspen stands - as well as “other” identified aspen stands throughout the life of the project. > Purchase property or water rights associated with the Brunea Wildlife Management Areas, which includes Stowell property match for NDOW funding and a seed storage facility that would be secured by NDOW and other agency partners with $1.5 million requested for initial construction of the facility and $375k for staffing it for the next 5 years – including benefits. > Undisclosed cost of restoring native grasses on 10,400 acres. > Removal of 92 miles of roads insides WSA’s at undisclosed costs. 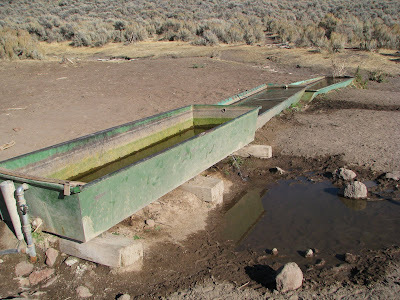 - The only two remaining springs left for wild horse use in the Massacre Lakes HMA (located in the Juniper Pasture on the Massacre Lakes Allotment), Post Springs and Indian Springs. - Fencing of the 40 acres Miller and Lux Springs in the Nut Mountain Allotment that overlaps the Nut Mountain HMA. - Fencing Idaho Canyon Springs that overlaps the Calico HMA. - Rock Springs in the Wall Canyon HMA, where BLM Winnemucca photo files from 2008 obtained via FOIA cites Rock Springs as exclusively used by wild horses and is specifically marked as “No Livestock Use” by BLM. Meanwhile, the Draft Migratory Bird Conservation Plan states “the replacement and/or repair of fencing around Rock Springs would control trespass livestock” and in another section titled “Rock Springs Spring Enhancement”, the plan is to fence "approximately 40 additional acres of the spring and meadows and pipe water to a trough outside for livestock, feral horses, and big game species”. So much for exclusive use by wild horses…. 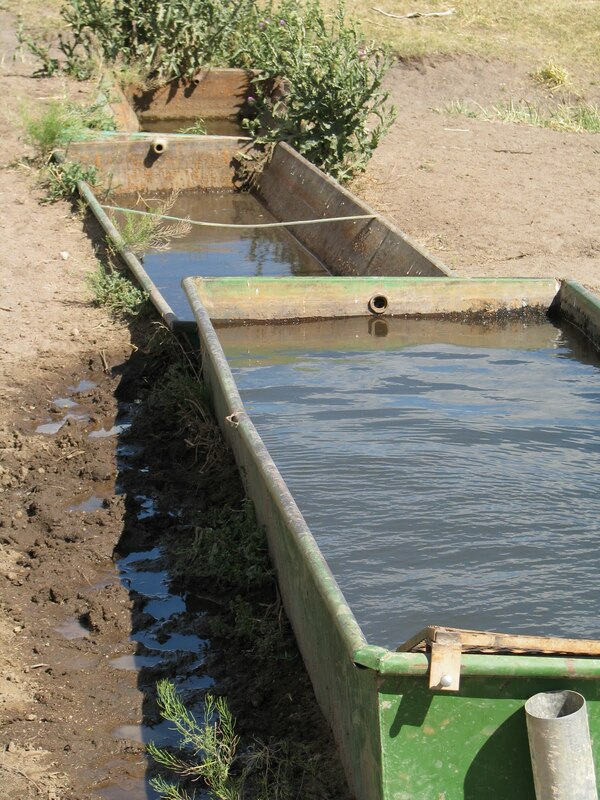 However, in the spirit of fairness, some of the proposed exclosures are allowing for pipelines to carry water to troughs that would be located outside the fenced springs for continued wild horse and/or burro use. 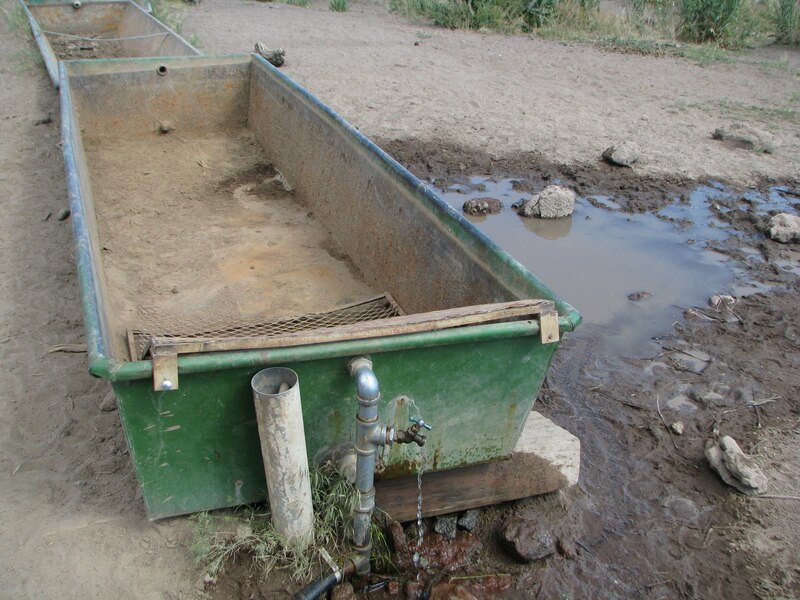 Rock Springs, titled "Faucet found open, water loss, troughs dry". Rock Springs titled, "Faucet open, water loss, troughs dry". Rock Springs, titled, "Troughs after turning off faucet found open". And one year later? 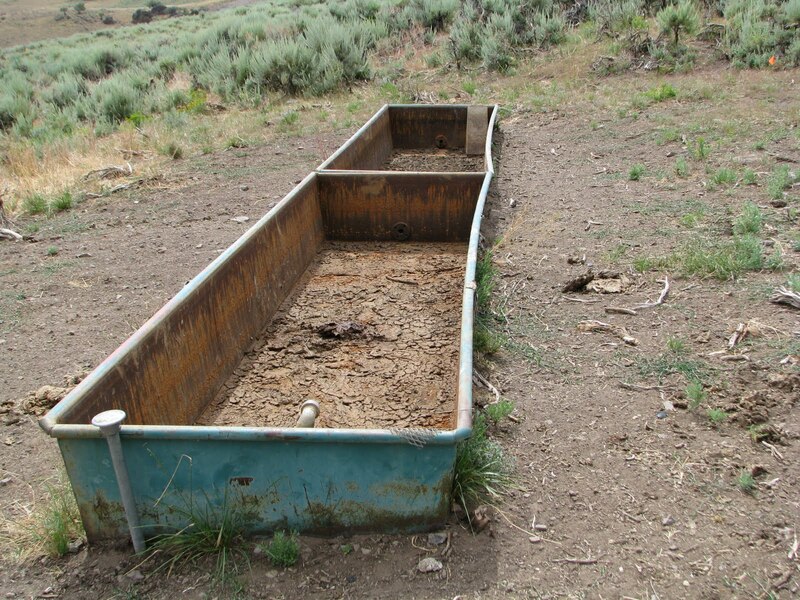 Rock Springs, merely titled,"Troughs Empty". As Colorado based El Paso Gas Corporation was backpedaling earlier this year about their involvement with wild horses and burros affected by the Ruby Pipeline by pointing out that everything they would do would be according to “BLM policy”, one of the issues the astute reader of Ruby’s Final EIS will note is that all Ruby’s proposed mitigation measures for access to water by wild horses and burros involves hauling water, not the establishment of long-term water sources – those are being considered for fencing during the four year mitigation and reclamation process. 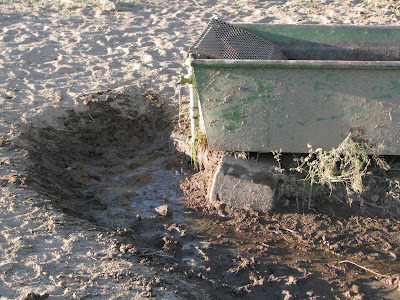 BLM also fired back at the suggestion of Ruby’s behind the scenes involvement in the Calico Complex round ups by posting a Press Release on January 22, 2010, which essentially poo-pooed the idea that Ruby and BLM were doing anything less than honorable with respect to the management of wild horses and burros affected by the pipeline. However, a press release doesn’t hold water in the legal arena – just ask Judge Friedman – and the legally established BLM “policy” that Ruby will follow has lots and lots of loopholes managers from a variety of agencies can evoke at their discretion. As the Ruby Final EIS proposes to formalize a blanket agreement to “erect fences to restrict animal movement out of the HMAs” for undisclosed miles at equally undisclosed locations and BLM’s Tuscarora and Winnemucca Field Offices are working hand in hand with Nevada Department of Wildlife and USFWS to feed Ruby a Wish List that will fence miles more of critical water sources, meadows and habitat away from wild horses and burros – as well as possibly just unloading public lands to be managed by corporate partnerships with anyone but BLM - we, the public can rest assured that BLM will be as open, honest and humane about what they are really doing behind the scenes as they have been with the handling of the Calico Complex wild horses over the last several months. 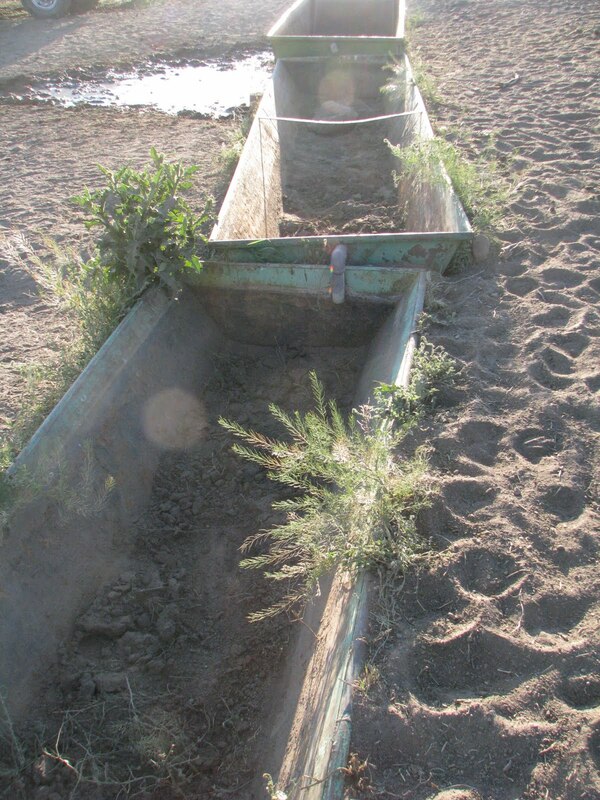 For a more detailed accounting of the daily death tolls, restriction on public access and BLMs transparent operations of the Wild Horse and Burro Program, visit the Humane Observer by Elyse Gardner, who has chronicled the on-the-ground realities faced by the Calico Complex wild horses since their removals began. As for El Paso Gas Corporation, they have lots of on-board experience with those who know how to pass the buck of responsibility to anyone but themselves as in early December, Timothy J. Probert was named to their Board of Directors. Mr. Probert also is currently serving as the President of Halliburton, Global Business Lines, which includes both Drilling and Evaluation and Completion and Production divisions and their respective service lines. Wonder if Mr. Probert’s division of Halliburton had anything to do with all the scandals involved in the Minerals Management Services or the currently unfolding tragedy now being played out in the Gulf Coast, thanks to all those “cozy relationships” between corporations, government employees and multi-billion dollar projects that allow the by-pass of environmental protection laws such as NEPA in favor of doing business at the national expense. While President Obama recently slammed British Petroleum, Transocean and Halliburton for “falling over each other to point the finger of blame at somebody else” at recent Congressional hearings over the gulf oil horror, what the public hasn’t seen is any real reform or change under Obama’s pick for Secretary of the DOI as the Colorado based Salazar has a long, long history of support for the energy industry, including the approval last year of the British Petroleum’s exemption from doing the required detailed environmental analysis at the Deep Water Horizon site now hailed as fast becoming an unprecedented ecological disaster. As Judge Friedman ruled that any prayer for relief to the public and the Calico horses is now moot and Gulf Coast residents are learning the dirty truth about the greasy realities of the DOI, Secretary Salazar pushes onward in his determination to ram through his Wild Horse & Burro Initiative in this BLM sponsored Denver Public Workshop on June 14, 2010, which will focus exclusively on Salazar's brainchild of leaving merely a few treasured herds of wild horses and burros on public lands while the rest are sterilized to achieve reproduction cycles that match fluctuating adoption demands or carted off to mostly private Sanctuaries in the Mid-West or Eastern states far removed from their native, "protected" ranges. Wonder what the $42 million dollars Salazar has requested from Congress to purchase land back East for warehousing our wild horses would do if it was dangled in front of state Fish & Game Departments and Sheldon NWR instead to ensure “mitigation measures” for the long-term management of wild horses and burros too. But then, Secretary Salazar has publicly stated there is no longer any “room” for wild horses and burros out West anymore and apparently, President Obama and his administration continue to support Secretary Salazar 110% - no matter what the cost. So, we the public are left to live with the mess, stand witness to the dying and deceased while simultaneously being herded down the Obama/Salazar canyon of “work shopping” on how we believe the DOI can best implement the final destruction of our American herds under Salazar’s Initiative. Secretary Salazar, do you really want to try something new in the Wild Horse & Burro Program? Why don’t you demand the DOI start following the spirit and intent of the Wild Free-Roaming Horse and Burro Act instead of devoting all its resources to circumventing it. Now that would be a change for sure! The BLM does not know how to manage the Mustangs; this is because they are not knowledgeable in the area of Nutrition; Feed; and shelter; they ruin the 'Stangs! Another Roundup would be disaster! The BLM doesn't WANT to know anything about the horses - they just want to get rid of them.